^ a b c d e f g h i j k l Humle, T., Maisels, F., Oates, J.F., Plumptre, A. & Williamson, E.A. 2016. Pan troglodytes (errata version published in 2016). The IUCN Red List of Threatened Species 2016: e.T15933A102326672. https://doi.org/10.2305/IUCN.UK.2016-2.RLTS.T15933A17964454.en. Downloaded on 08 April 2018. Oates, J.F., Doumbe, O., Dunn, A., Gonder, M.K., Ikemeh, R., Imong, I., Morgan, B.J., Ogunjemite, B. & Sommer, V. 2016. Pan troglodytes ssp. ellioti. The IUCN Red List of Threatened Species 2016: e.T40014A17990330. https://doi.org/10.2305/IUCN.UK.2016-2.RLTS.T40014A17990330.en. Downloaded on 08 April 2018. Plumptre, A., Hart, J.A., Hicks, T.C., Nixon, S., Piel, A.K. & Pintea, L. 2016. Pan troglodytes ssp. schweinfurthii (errata version published in 2016). The IUCN Red List of Threatened Species 2016: e.T15937A102329417. https://doi.org/10.2305/IUCN.UK.2016-2.RLTS.T15937A17990187.en. Downloaded on 08 April 2018. Maisels, F., Strindberg, S., Greer, D., Jeffery, K., Morgan, D.L. & Sanz, C. 2016. Pan troglodytes ssp. troglodytes (errata version published in 2016). The IUCN Red List of Threatened Species 2016: e.T15936A102332276. https://doi.org/10.2305/IUCN.UK.2016-2.RLTS.T15936A17990042.en. Downloaded on 08 April 2018. Humle, T., Boesch, C., Campbell, G., Junker, J., Koops, K., Kuehl, H. & Sop, T. 2016. Pan troglodytes ssp. verus (errata version published in 2016). The IUCN Red List of Threatened Species 2016: e.T15935A102327574. https://doi.org/10.2305/IUCN.UK.2016-2.RLTS.T15935A17989872.en. Downloaded on 08 April 2018. ^ The International Chimpanzee Chromosome 22 Consortium (2004). “DNA sequence and comparative analysis of chimpanzee chromosome 22”. Nature 429: 382-388. doi:10.1038/nature02564. PMID 15164055. ^ Chimpanzee Sequencing and Analysis Consortium (September 2005). “Initial sequence of the chimpanzee genome and comparison with the human genome”. Nature 437 (7055): 69?87. Bibcode: 2005Natur.437...69.. doi:10.1038/nature04072. PMID 16136131. http://www.nature.com/nature/journal/v437/n7055/full/nature04072.html. ^ Kuroki et al. (2006). “Comparative analysis of chimpanzee and human Y chromosomes unveils complex evolutionary pathway”. Nat. Genet. 38: 158-167. doi:10.1038/ng1729. PMID 16388311. ^ Varki A. and Altheide T.K. (2005). “Comparing the human and chimpanzee genomes: searching for needles in a haystack”. Genome Res. 15: 1746-1758. doi:10.1101/gr.3737405. PMID 16339373. ^ Webster M.T. Smith N.G. and Ellegren H. (2003). “Compositional evolution of noncoding DNA in the human and chimpanzee genomes”. Mol. Biol. Evol. 20: 278-286. doi:10.1093/molbev/msg037. PMID 12598695. ^ Groves, Colin. (2001) "Primate Taxonomy", pp. 303-307. Washington, DC: Smithsonian Institution Press, ISBN 9781560988724. ^ Hof, Jutta; Sommer, Volker: Apes Like Us: Portraits of a Kinship, Edition Panorama , Mannheim 2010, ISBN 978-3-89823-435-1, p. 114. ^ M. Katherine Gonder, John F. Oates, Todd R. Disotell, Michael R. J. Forstner, Juan Carlos Morales & Don J. Melnick (1997). 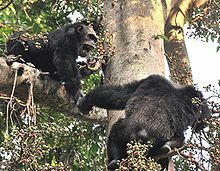 “A new west African chimpanzee subspecies?”. Nature 388: 337. doi:10.1038/41005. ^ Colin P. Groves (2005a). “Order Primates”. In Don E. Wilson & DeeAnn M. Reeder (editors). Mammal Species of the World. A Taxonomic and Geographic Reference (3rd ed.). Johns Hopkins University Press. pp. 111-184. https://www.departments.bucknell.edu/biology/resources/msw3/browse.asp?id=12100798. ^ John F.Oates, Colin P. Goves & Paulina D. Jenkins (2008). “The type locality of Pan troglodytes vellerosus (Gray, 1862), and implications for the nomenclature of West African chimpanzees”. Primates 80 (1): 78-80. doi:10.1007/s10329-008-0116-z. ^ Groves, CP (2005b). “Geographic variation within eastern chimpanzees (Pan troglodytes cf. schweinfurthii Giglioli, 1872)”. Australasian Primatology. http://arts.anu.edu.au/grovco/schweinfurthii.pdf+html. ^ Whiten A; Goodall J,McGrew WC,Nishida T,Reynolds V,Sugiyama Y,Tutin CEG,Wrangham RW,Boesch C (1999). “Cultures in chimpanzees”. NATURE 399 (6737): 682-685. ^ Nakamura M (2009). “Culture in nonhuman primates”. REICHORUI KENKYU/ PRIMATE RESEARCH 24: 229-240. ^ a b ニュース - 動物 - 赤ちゃんチンパンジーを保護、コンゴ - ナショナルジオグラフィック 公式日本語サイト（ナショジオ） Archived 2013年3月24日, at the Wayback Machine.